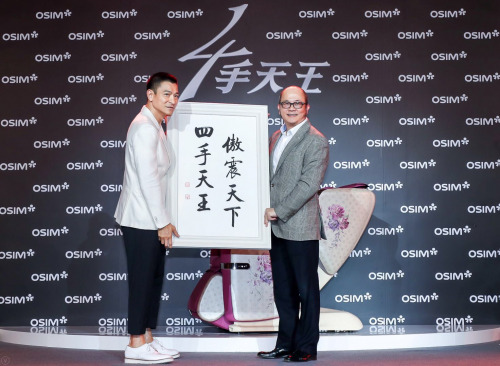 2 April 2019, Heavenly King Andy Lau made an appearance at Shanghai Pudong Shangri-La as he transformed into “artiste producer” as he was present to promote OSIM 4-hands heavenly king massage chair. Being old friends with OSIM, Andy’s endorsement of 4-hands heavenly king massage chair is his third time collaborating with the brand. Being multi identities of movie producer, filmmaker, director and actor, Andy changed his title to OSIM artiste producer as he became the spokesman for OSIM 4 hands massage chair which has “looks, acting skills, talent and talking point”. He said: “I like the comfortable feel that it brought to me, as it allowed me to be completely relaxed during my free time, and its’ upgrade is a surprise to me, 4 hands massaging gave me an out of this world massage experience!” Andy shared his personal experience with the media, guests and fans present.